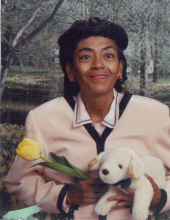 Phyliss Robbins, 63, of Decatur, Illinois passed away on Saturday, April 6, 2019 at her residence. Phyliss was born on October 03, 1955 in Decatur, Illinois the daughter of Charlie and Vivian Robbins. She relocated to Texas where she lived for 20 years and assisted with raising her grandchildren before moving back to Decatur. She attended Decatur Public Schools and graduated from Roffler Barber College in Fort Worth, Texas (1988). Phyliss was a member of the St. Peter A.M.E. Church and worked as a home health care provider. She enjoyed baking and her specialty was bread rolls. She met many people thru the baking of her rolls. She spent a lot of time feeding and ministering to the homeless. She leaves to cherish her loving memory: her daughter, Demetra (T.J.) Williford; grandchildren: Kayla Williford, Micah Williford and William Williford; one great grandchild; sisters: Judy Robbins, Jhan Robbins Jelks and a host of aunts, uncles, nieces, nephews, cousins and friends.Phyliss was preceded in death by her parents, grandparents, brothers: Carlos, Larry, Richard D. and Brent Robbins; sisters: Lenora and Martha Robbins and many aunts, uncles and cousins. To send flowers or a remembrance gift to the family of Phyllis Robbins, please visit our Tribute Store. "Email Address" would like to share the life celebration of Phyllis Robbins. Click on the "link" to go to share a favorite memory or leave a condolence message for the family.